The following short story fragment appears in the McCready-Hurley Ledger amidst pages of penmanship practice and hymn lyrics. It’s unclear whether the writer was copying an existing story, or writing an original draft. I’ve searched Google for several specific phrases to see if the material was published, with no luck. Some of the periods might represent commas. Sadly, the story ends mid-word, but even so, these few sentences are fascinating. Today there is a Cherry Hill Road in Northumberland County, Virginia, fairly close to places mentioned in Meshack McCready’s journal entries such as Burgess Store and Heathsville. This fact, plus the reference to “Md” (Maryland), plus the trip on the boat, plus the fact that both Meshack McCready and the Hurley family were from Dorchester County, Maryland, strongly suggests that this fragment was intended to be a firsthand account of somebody’s trip across the Chesapeake Bay to Cherry Hill, or perhaps a fictional story based on it. The reference to “old servants not indentured” is especially interesting. An article in the Rappahannock Record dated October 21, 1948, mentions a historic home called Cherry Hill which was believed to have been built nearly three centuries earlier by Roger Jones. Despite some spelling errors, the writer obviously had talent; his or her image of the grand old house and its lofty elms is striking. Hopefully, further study of the ledger and the family who owned it will shed more light on this tantalizing piece of writing and its relationship to their story. Last week I bid on a few items in an online auction held by Allen & Marshall, and managed to win four lots of Worcester County (and/or Wicomico County) land documents, as well as a ledger which was advertised as containing the names of Civil War soldiers from Dorchester County, but which turned out to be something rather different — and no less interesting. In the interest of making the content of the documents available to the public (and I hope the winners of the other lots will do so as well), I’m sharing the following scans of some of the documents, as well as a little bit of information about each. 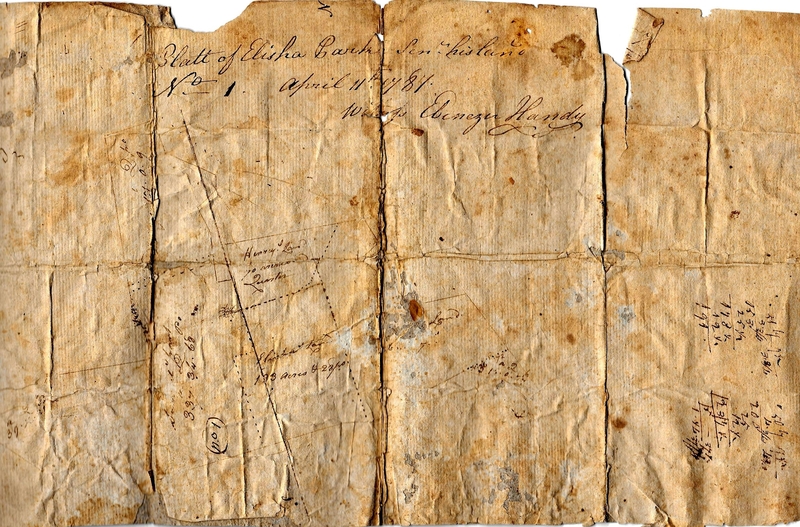 Two, an 1810 deed from John and Elisha Parker to Billy Parker, and an 1882 deed to James Oliphant, are too large to scan. The original Parker’s Delight was surveyed for Elisha in 1756, and consisted of 54 acres. The addition of 175 acres of vacant land resulted in the a 228-acre tract appropriately named Parker’s Delight Enlarged. The description mentions “the Head of Wilkins’s Branch” as well as a tract named Mathvin’s Chance. 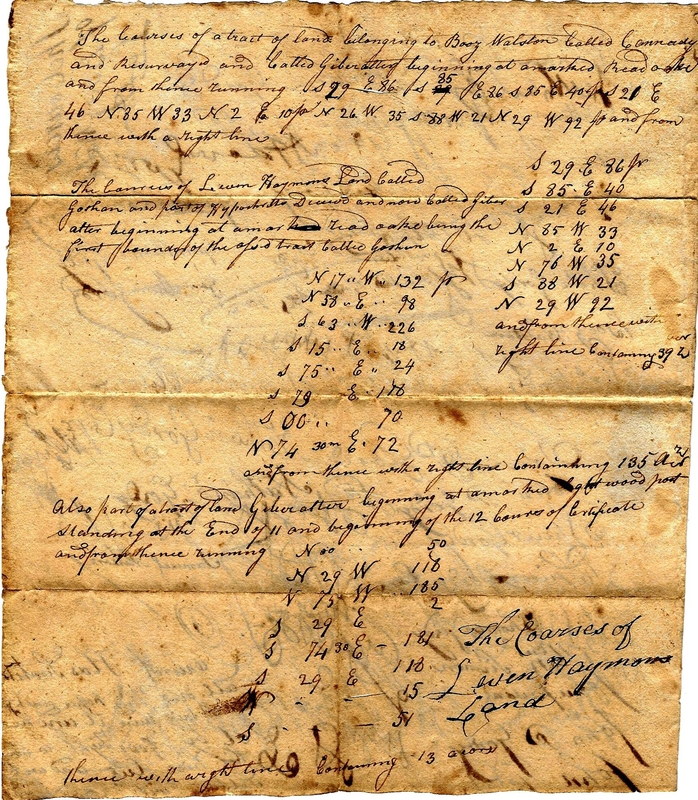 The above plat is dated April 11, 1787, the same day on which Elisha made his will. He died within the next few months, for the probate date is December 7, 1787. At that time, witness Ebenezer Handy was also said to be deceased. This document was actually included with the certificate for Parker’s Delight Enlarged, but I’m not sure whether they’re related. 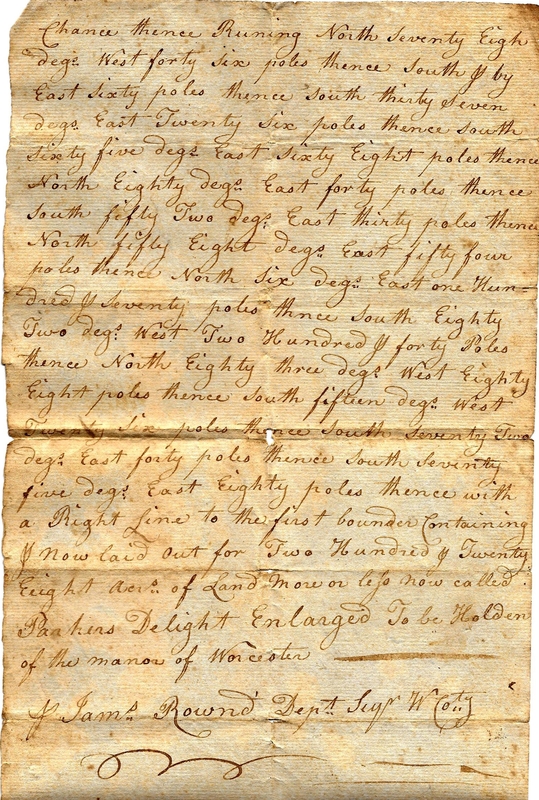 A 40-acre tract named Canada was surveyed for Boaz Walston in 1771, and patented to him in 1773; it was described as being in “wicicomico forrest on the south side of a tract of land formerly granted unto David Smith and about two hundred yards to the westward of the aforesaid Walstons dweling Hous…” In 1815, a rather large tract named Gibralter was surveyed for Walston, including parts of tracts named Canada, Canaan, Pea Patch, and Goshen. 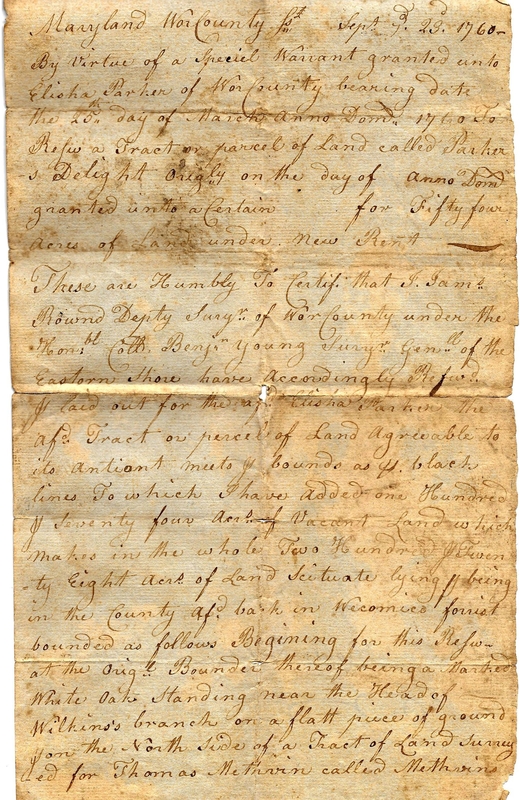 This deed describes the sale of a 7-acre lot known as or including “the Walsten Steam Mill Lot” located “on the north side of and binding on the County road leading from Salisbury to Parsonsburg and about five miles from the first mentioned place, and in Parsons District Wicomico County Maryland, and near Beave Dam Branch…” The previous owner, George M. Richardson, had purchased the lot from Stansbury W. Smith. The sixth and final item, which was incorrectly described as a ledger containing the names of Civil War soldiers from Dorchester County, but which I’m calling the McCready-Hurley Ledger for the sake of convenience, is very interesting, and is going to take some time to research. Though one Winfield Hurley wrote “Drawbridge Dorchester County Maryland” next to his name on the inside front cover, and the first page is signed by M. J. McCready and dated 1868, the next few pages consist of a list of names (first and middle initials, and last names), followed by each man’s rank, company, regiment, and abbreviated remarks. The order seems to be random, and the men belonged to various companies in various Confederate regiments. So far I’ve been able to match a dozen or so to documented Confederate soldiers from Georgia. The first name I looked up, E. S. Mitchell, turned out to refer to Eugene Severn Mitchell, who was captured in Petersburg, Virginia, in 1865, and imprisoned at Fort Delaware. 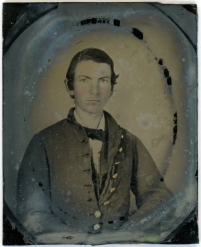 Mercer University holds a few of his personal letters, as well as a splendid dagguerrotype depicting the young man. Sadly, he died in 1871 at age thirty. E. S. Mitchell is the second name listed in the ledger. At one point he was imprisoned in Fort Delaware before returning to Georgia after the war. The coded or abbreviated remarks after each name are a bit difficult to read, and I confess that I have no idea what one of them — “CB” — means. Hopefully some knowledgeable person will remedy my ignorance. Other remarks like “Fur” and “Ret” probably stand for furloughed or retired, respectively. The list goes on for a few pages, after which the ledger becomes even more interesting, in my opinion, including a sort of prayer journal written by Meshack McCready, notes about the weather, many pages of penmanship practice, and a number of poems and songs. Various items are signed by various members of the Hurley family. A bit of digging revealed that both McCready and the Hurleys were from Dorchester County, but moved to Northumberland County, Virginia, prior to 1867 (when McCready began writing in the ledger). McCready was living in the household of Joel and Sarah Hurley in Burgess Store in 1870. Sarah’s maiden name was McCready, so it’s likely that she was his sister. Although I haven’t been able to discover his fate, the Hurleys moved back to Dorchester before 1880, and, apparently, kept the ledger and continued to write in it infrequently. I plan to transcribe and publish as much of the ledger’s contents as possible (though some of the soldier’s names, in particular, are difficult to read), and hope to learn more about the family that preserved it for many years.